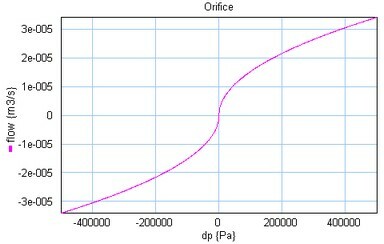 Here Cd is the discharge coefficient which normally has a value between 0.55 and 0.7 and A is the area of the orifice opening. Gleak is the conductance of laminar leakage flow when the valve is closed. Conductance of the laminar leakage flow [m3/s.Pa], GLeak >= 0! Orifice Area [m2], A >= 0!